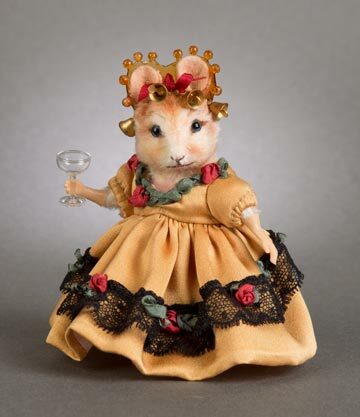 The Toy Shoppe offers the finest selection of dolls, Teddy bears, adorable mice and other creations by R. John Wright! Precious holiday friends all shapes and sizes! Charlie Chaplin, Shirley Temple & more stars! Wizard of Oz, Fairies, Fables & other friends! Every great object created begins with design. R. John Wright's design often originates with source material from famous children's illustrations as John and Susan have a great love for well-known characters from classic children's books. What is most impressive in this endeavor is that each piece created from these illustrations remains true to the original artwork. Each is truly the definitive interpretation of these most famous childhood characters. Their designs are also inspired by nature. The realism with which they create their bears, mice and other animals is matched only by their ability to introduce such character and personality in them without resorting to caricaturish extremism. In our opinion, the making of an heirloom piece requires a marriage of fine design and quality craftsmanship. Poor manufacturing can shatter an artist's fine design. The RJW Workshop employs a unique process to address this. After designing an edition, John and Susan oversee every step of production at their workshop in Vermont ensuring each piece lives up to their artistic vision. Under their watchful eyes, a highly skilled team of trained artisans puts each limited edition into production, detailing and finishing these treasures by hand. Due to the complexity of their original desins, John and Susan must often develop innovative techniques to insure that the edition remains consistent and uniform throughout production: the first piece in the edition must be as wonderful and charming as the final one. Technically speaking, as amazing and delightful as the early R. John Wright creations were, the newer pieces are far more complex. Todayâ€™s RJW designs are now brought to life in a way that they never could have been done 20 years ago. Felt has been the material of choice from the earliest R. John Wright dolls. Felt is an extremely difficult material with which to work. In the history of fine toy making, we can count Steiff and Lenci as amongst the leaders in the use of felt. R. John Wright has gone beyond each of these makers in his use of this complex media. We particularly love the artistic manner with which felt is used to create beautiful objects of nature, including leaves, fruits and vegetables. Charlie Chaplin became a worldwide sensation through his screen persona "The Little Tramp" and is considered one of the most important figures in the history of the cinema. Charlie Chaplin joins the exciting R. John Wright group of dolls based on the classic Hollywood Legends. Extensively researched for the utmost in authenticity, John and Susan Wright have captured the spirit of Chaplin in this fully licensed, very limited edition. Even his iconic "Little Tramp" costume is sheer perfection. No detail has been overlooked! Each Charlie Chaplin purchased from The Toy Shoppe will be signed by the artist, R. John Wright! 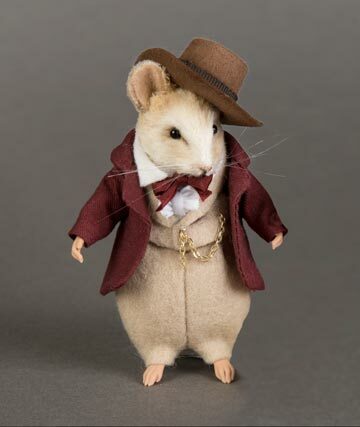 Each GONE WITH THE WIND™ mouse bought from The Toy Shoppe will be personally signed by the artist, R. John Wright! 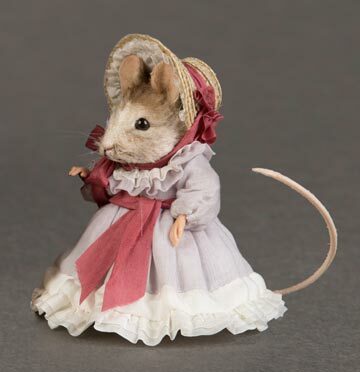 Regarded as one of the greatest films of all times, the unforgettable characters from GONE WITH THE WIND™ are brought to life as petite mice in this wonderful series by John and Susan Wright. 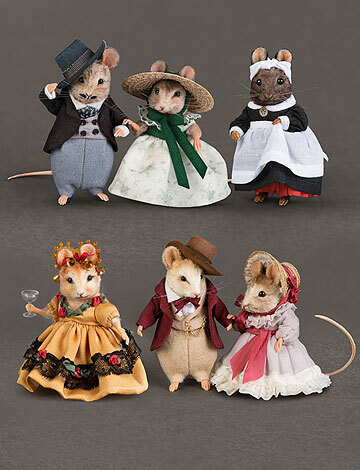 Each mouse captures the essense of of these beloved characters: Rhett Butler, Scarlett O'Hara, Ashley Wilkes, Melanie Hamilton, Mammy and Belle Watling. 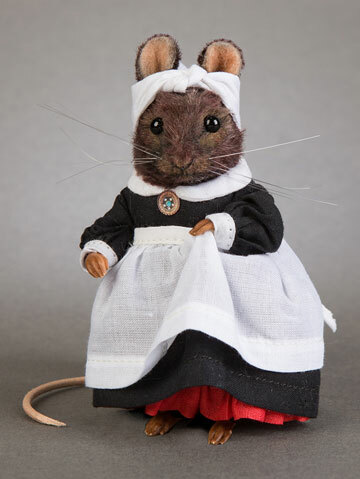 The mice are crafted entirely by hand at the RJW Workshop in Vermont. Naturally artistic, R. John Wright always felt his path would lead to a creative career. Born in Michigan, John attended Wayne State University in a liberal arts program with an emphasis on art and literature. Following college, John traveled to New England and settled in New Hampshire. While browsing in a bookstore, John came across a book, The Doll, authored by Carl Fox. Intrigued with the profusion of photographs featuring antique dolls and having recently made the acquaintance of porcelain dollmaker, Gail Duggan, John began to contemplate the possibility of a career in doll making. Two years later, he met his future wife and creative partner, Susan, who was a recent graduate of the University of New Hampshire with a Bachelor of Fine Arts Degree. Little did she suspect that her meeting with John would redirect her talents and destiny to doll making. The couple settled in Brattleboro, Vermont in 1974. In 1976, when he was abruptly laid off from his job as a clerk in the town hardware store, John decided to try his hand at doll making. That afternoon he began to sew a crude figure - his first doll - out of the only fabric at hand, a piece of pale yellow flannel. John had never sewn anything before, but this first effort came quickly and the process seemed to hold much potential - he could only get better! Before the first doll was completed, he was already thinking of the improvements he would make on the second one. Within a few weeks of having been employed as a clerk in the hardware store, John made a group of six similarly constructed men dolls out of flesh-colored felt. These dolls featured rudimentary rustic-style clothing and sheep's wool hair and beards. He took these first dolls to a crafts gallery downtown where they were purchased on the spot to retail for the price of $28 each. During the next six months, John made and sold over a hundred of these primitive felt dolls to area craft stores. Susan increasingly helped John with the production and together they embarked on an intense period of research. Within six months the dolls advanced beyond the primitive stage and featured joints and more sophisticated clothing and accessories. The doll work soon overtook the couple's small ground-floor apartment turned into a makeshift doll factory. Exhibition in juried craft shows throughout New England provided the expanding wholesale and retail orders for the dolls. They soon began hiring assistants to come to the apartment and help with the ever-increasing work load. One year after making his first doll, John sculpted the faces which would become his first molded felt dolls. Designs soon followed depicting Character Dolls with ethnically-inspired costumes and accessories. The delightful Little Children Series premiered in 1980 around the time of the birth of the Wright's first child. The child dolls introduced a new look from R. John Wright and the demand from collectors increased. The business moved to Cambridge, New York where a highly skilled workforce was trained and specialized machinery developed to increase production. In 1985, R. John Wright Dolls, Inc. exhibited their work at International Toy Fair in New York City. At this show, the first prototype of Christopher Robin & Winnie-the-Pooh was shown produced under license to the Walt Disney Company. Over the next decade all of the animal characters from the Hundred Acre Wood were also produced. In 2003, an exciting new Winnie-the-Pooh Collection made exclusively for Japan was launched. The following years brought a succession of many captivating child dolls as well as licensed characters from classic Disney films: Snow White and the Seven Dwarfs and Pinocchio. In 1998, R. John Wright introduced Peter Rabbit, the first in an exciting series based on the characters of Beatrix Potter. Soon to follow were Jemima Puddle-duck and Benjamin Bunny and many other delightful Potter characters - each meticulously detailed and crafted out of mohair in numbered limited editions. In 1999, the company introduced the R. John Wright Kewpie. Created by Rose O'Neill in 1909, this represented the first time that the Kewpie character was made in the medium of molded felt. 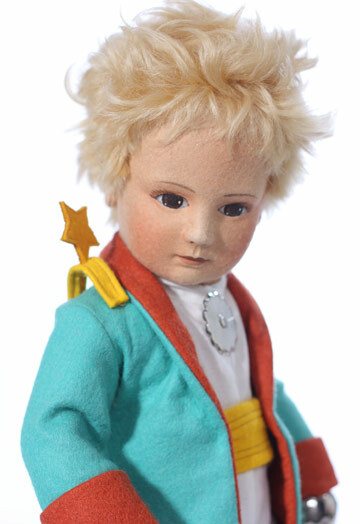 Continuing a tradition of dolls and animal characters based on classic children's literature, the company also produced Michael Bond's Paddington Bear, a delightful mohair rendition of Curious George and dolls based on Antoine de Saint Exupery's beloved character The Little Prince. The year 2002 marked the centennial celebration of the birth of the Teddy Bear and R. John Wright produced several special editions including an all-felt doll of Teddy Roosevelt. Today, John and Susan Wright continue to head their enterprising and innovative company. The Wrights continue to oversee all phases of production which is still performed on-site, always stressing the highest quality in craftsmanship and integrity of design which for over twenty-five years have formed the cornerstone of all R. JOHN WRIGHT collectibles. Editions introduced in 2003 were an all-felt rendition of Lewis Carroll's immortal Alice based on the original illustrations by Sir John Tenniel, and a figure of Santa Claus based on Thomas Nast's landmark drawings. 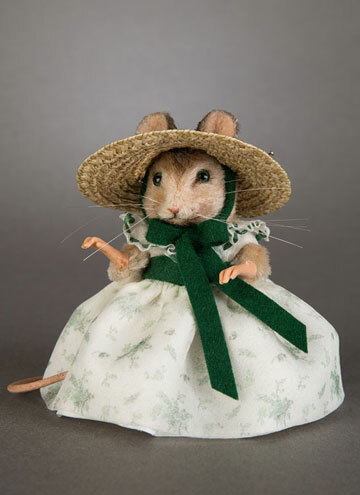 R. John Wright dolls and animals have been honored with numerous awards, among them: the Doll of the Year (DOTY) award; the Golden Teddy award; the Dolls magazine Award of Excellence; and Der Goldene George Award. In 1994, R. John Wright was the recipient of the Jumeau Trophy - considered by many collectors and artists as one of the most prestigious symbols of recognition for acheivement in the doll field. In 2003, the first fully-authorized comprehensive book on the work of R. John Wright, R. John Wright - The Art of Toys, was published by Portfolio Press. In 2004, R. John Wright Dolls returned to Vermont moving their innovative and enterprising company to an idylic 17-acre setting on the outskirts of historic Bennington. The Wrights continue to oversee all phases, always stressing the highest quality materials, craftsmanship and integrity of design which for three decades have formed the cornerstones of all R. JOHN WRIGHT collectibles. There are ongoing new additions to the Alice in Wonderland Series, the Raggedy Ann Collection, and the Beatrix Potter Collection. 2006 also brought Walt Disney's Minnie Mouse and the beloved French storybook character Becassine. 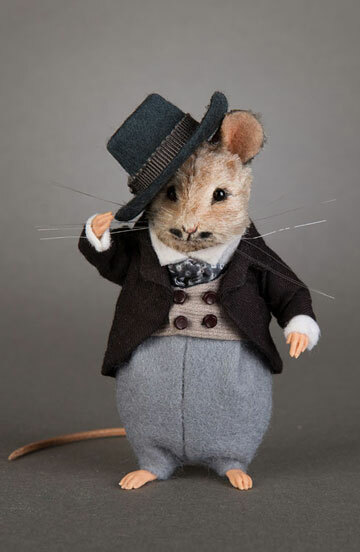 John and Susan continue to create and innovate with delightful felt dolls, bears, mice and many other characters. Continuing series such as the Alice in Wonderland Series and the Beatrix Potter Collection have been joined by new, exciting editions like the Palmer Cox Brownies, Goldilocks & The Three Bears, Edith The Lonely Doll and The Bears-At-Sea. John and Susan are the preeminent artists in their field and The Toy Shoppe is proud to be your premier shoppe for R. John Wright Collectibles, both past and present editions!